Times of Services: 10.30am with worship often led by the worship band. Creche facilities available plus Sunday Club for children. Sunday 25th August - 10:30am - We give thanks for Rev Mary Playford's ministry among us. This will be her final service before she retires. "Tiddlers", a Baby and Toddler Group, meets on Mondays during term time, 9:30am - 11:00am. Scrabble Club on Monday afternoons, 2:00pm - 4:00pm. "Knit for Peace" takes place on the 1st Wednesday of each month. Prayer Time, "Christians Together" takes place on Thursdays from 10:30am during term time. On Thursdays, Rainbows meets between 5:30pm and 6:30pm. Brownies takes place from 6:30pm onwards, term time. 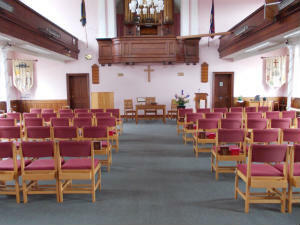 Hall lettings to community groups and for functions can be made. 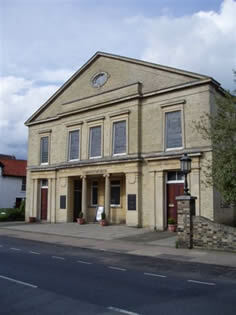 Presently several local groups meet at Christchurch during the week including Weight Watchers, Musical Moo - music group for pre-school children, Rainbow Guides and Brownies and Karate classes. See website for contact details.